We have asked our wonderful bar team to share the recipe for one of the most popular cocktails on the menu: a lemongrass martini. If you’re having friends round this weekend, shake them up this cocktail. Its guaranteed to impress, with a fresh, zingy flavour that everyone will love. If you’d like to salt rim your glass, sprinkle a teaspoon of sea salt in a flat, wide dish. Using a segment of the squeezed lime, wipe the flesh around the rim of the glass to wet it, and then dip the rim in the salt. Strain the liquid mixture into your serving glass and fill with ice. Top with your choice of garnish. We went for a slice of orange, a spiral of lime rind and a biodegradable straw. 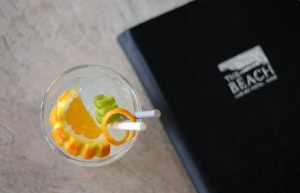 We have a delicious mocktail available in the bar at the moment, the perfect antidote to feeling left out if you’re the designated driver or attempting to go alcohol-free. 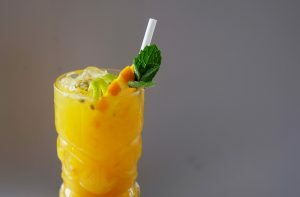 Blending an exotic combination of fresh passionfruit, lime and pineapple, the flavours mix together perfectly, resulting in a delicious drink with a healthy dose of fruit too, and we’ve shared the mocktail recipe. If your busy schedule doesn’t allow for a drink in the bar, try and make this tropical drink at home. Spoon the flesh from one half of the passionfruit into a tall serving glass. Add the mango purée, pineapple juice, Monin syrup and the juice from half of the lime. Stir the mixture carefully and top with ice. Spoon the remaining passionfruit flesh onto the top of the ice, and top with your choice of garnish. We went for a slice of orange, a spiral of lime rind and a sprig of fresh mint with a biodegradable straw. 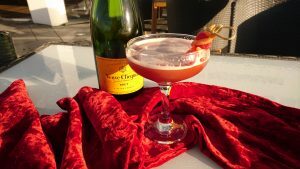 Valentine’s Day is the perfect excuse to indulge your other half, or yourself, so in celebration of the most romantic day of year, we’ve shared our recipe for a chocolate and strawberry martini, a deliciously decadent blend that is super easy to make. Shake the cocktail up at home to woo your other half, or invite your friends round and celebrate singledom together. – Combine all the ingredients in a cocktail shaker and shake vigorously for one minute. – Strain the cocktail into your chosen serving glass and serve alongside a shot of champagne for an extra dash of decadence. *This recipe has a reasonably subtle chocolate flavour. For more intensive flavour add 25ml of creme de cacao blanc. Our new cocktail menu is the perfect selection of drinks for summer, with vibrant flavours and refreshing blends that should most definitely be enjoyed in the sunshine. We thought we’d let you in on how to re-create two of our nonalcoholic mocktails, a cucumber and mint limeade, and a ginger and jalapeno lemonade, which couldn’t be easier to make. If a mocktail just won’t cut it, add a shot of your favourite gin and enjoy. – Muddle the cucumber, lime and mint in the bottom of a glass. – Half fill the cup with ice, add the remaining ingredients and stir. – Fill the glass to the top with crushed ice, and add soda. We have recently launched a great new cocktail menu in our bar, which has a great selection of delicious blends, along with some classic favourites too. 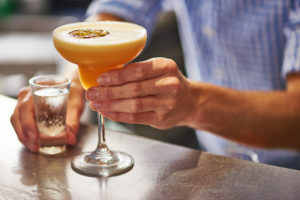 We thought we’d give you a slice of the cocktail action and let you in on how to make some yourself at home, with an easy-to-follow video tutorial from our talented bar manager Rudi West. 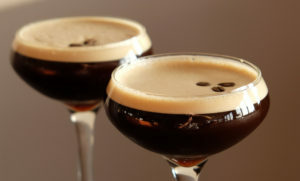 Watch the video of how to make an espresso martini cocktail, then give it a go yourself. 1. Chill your serving glass by filling it with ice and setting aside. 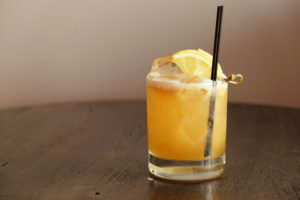 2.Place all ingredients in the glass half of the Boston cocktail shaker, fill the glass with ice, place the lid of the shaker on firmly and shake. 3.Remove the ice from the serving glass. Separate the Boston shaker, place the strainer on top and pour into the chilled serving glass for a lovely frothy finish. 4.Top with three coffee beans and serve. We have recently launched a new cocktail menu, brimming with exotic blends and delicious tipples to sip on in the bar. 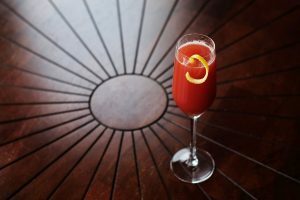 We thought we’d give you a slice of the action and let you in on how to make some, introducing our King of cocktails, bar manager Rudi West. Watch the video of how to make the cocktail, then give it a go yourself. 1. Place the egg white in the Boston shaker glass, discarding the yolk. 2. Add the disaronno, sugar syrup and lemon juice into the glass, place the lid of the shaker on firmly and shake. 3. Fill two thirds with ice and shake again. 4. Place cubed ice into your serving glass and strain the contents of the Boston shaker into it. 5. Garnish with the lemon wedges and serve. 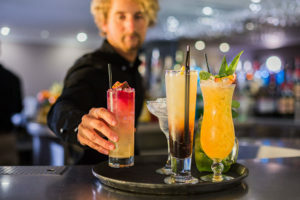 The Beach Bar cocktail menu has been shaken up and refreshed by our talented mixologist, Rudi, who’s used his extensive cocktail knowledge to create delicious blends, individually designed to stir your imagination and satisfy your taste buds. This cocktail is Rudi’s twist on the classic Moscow Mule, with added cranberries for a little zest and fiery ginger beer providing a real donkey kick. 1. Squeeze the limes into the glass and a drop the remains in. 2. Add eight of the cranberries and muddle the mixture, ensuring the lime and cranberries are crushed but not completely pulped. 3. Add the vodka and cranberry juice and stir with a drinks stirrer. 4. Add two or three ice cubes and top the mixture with the ginger beer. 5. Garnish with the remaining cranberries pierced onto the cocktail stick and serve. A refreshing and zesty blend guaranteed to quench anyone’s thirst, with one of your five-a-day thrown in for a guilt-free tipple… almost. – A coupe glass or something similar. 1. Place the raspberries, limoncello and sorbet into the cocktail and muddle the mixture to crush the raspberries and break the sorbet up. 2. Add a handful of ice, secure the top of the cocktail shaker and shake for about ten seconds. 3. Carefully drain the mix into the coupe and top with prosecco. 4. Garnish with a sprinkling of the mint leaf, a raspberry and serve. 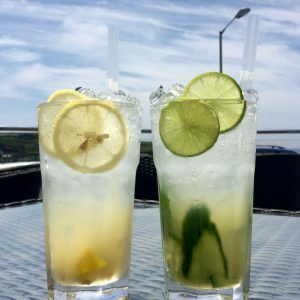 Give Rudi’s cocktail recipes a go and show us your pictures of them by hashtagging #beachatbudecocktails on Instagram, Twitter and Facebook.